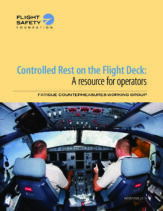 Controlled Rest on the Flight Deck: A resource for operators was developed by the Fatigue Countermeasures Working Group and is presented here as a service to the aviation industry by Flight Safety Foundation to facilitate discussion among industry stakeholders. The Fatigue Countermeasures Working Group is comprised of fatigue safety managers from a number of commercial air transport operators, primarily located in the United States; labor representatives from multiple pilot unions; and researchers and scientists from Clockwork Research, the National Aeronautics and Space Administration (NASA) Ames Research Center, Washington State University and various independent fatigue and human performance research organizations. 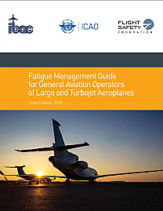 The The Fatigue Management Guide for General Aviation Operators of Large and Turbojet Aeroplanes, presented here by the International Civil Aviation Organization (ICAO), the International Business Aviation Council (IBAC) and Flight Safety Foundation, is based on the work of the ICAO Fatigue Risk Management Systems Task Force and includes input from experts with experience in general aviation (GA) operations. The Fatigue Management Guide is intended to familiarize GA operators with contemporary concepts of fatigue management and to provide guidance for implementation in day-to-day operations. The ICAO/IBAC/Foundation collaboration is a reflection of a mutual commitment to fatigue management and a common understanding of its implementation within the GA environment. 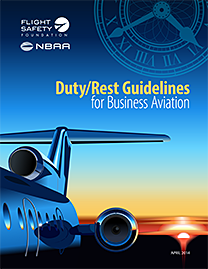 Duty/Rest Guidelines for Business Aviation is the culmination of a joint effort by the Flight Safety Foundation (FSF) and the National Business Aviation Association and is an update of “Principles and Guidelines for Duty and Rest Scheduling in Corporate and Business Aviation,” which originally was published by FSF in February 1997. The intent of the update was to consider scientific advances in the past 17 years, and to identify how those advances should influence today’s recommended practices for duty and rest scheduling. The original February 1997 study is still available on the FSF website. Please click here to access it. In the April 2014 issue of AeroSafety World, Wayne Rosenkrans, Senior Editor, wrote an in-depth article about this study. In the interest of providing valuable safety information to the entire industry, we are making this article immediately available to everyone. Please click here to read this article.